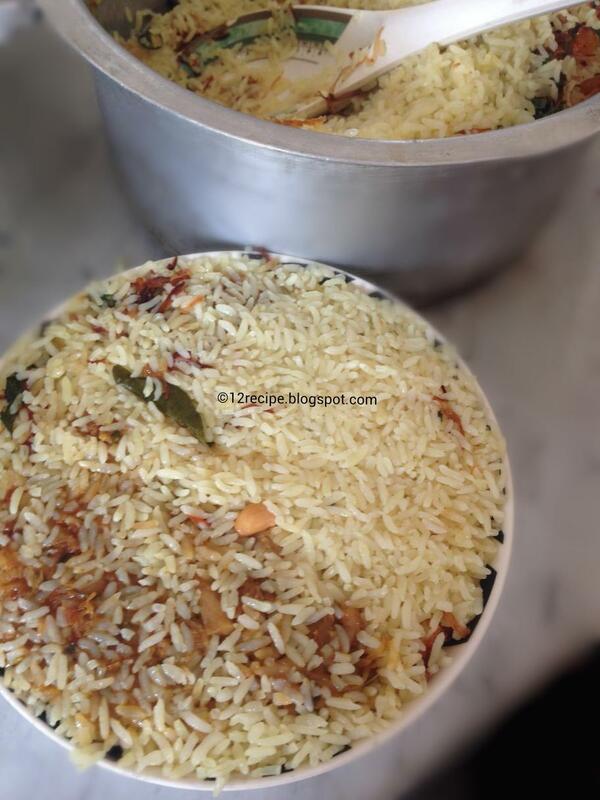 Biriyani is a flavorful rice recipe cooked along with meat, fish or often vegetables. Even though some of them cooking biriyani with the same ingredients; the taste differs a lot due to the difference in sauting time and amount of masala adding. 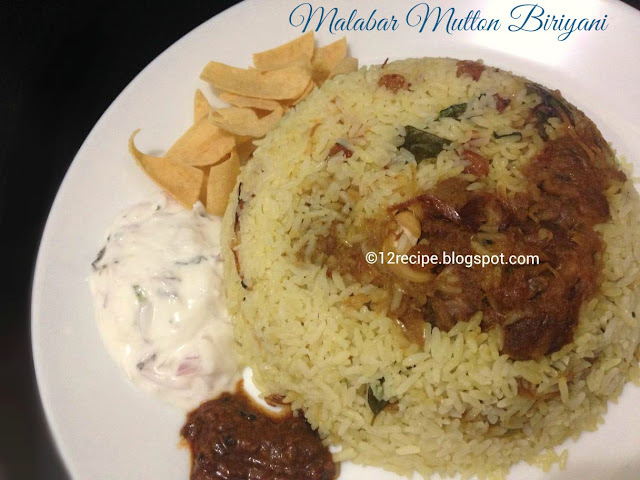 Malabar mutton biriyani is an awesome preparation of tender mutton cubes along with the flavorful rice. Marinate the mutton pieces with above marinate ingredients. Keep it in fridge for 1 hour. Pressure cooks it for few whistles until cooked. Mean while soak the rice in water for 40 minutes and drain. In a pan heat 2 tablespoons of oil and sauté onion very well. Add ginger, garlic, green chilly paste in to it. When the tomatoes are mashed well; add kas kas paste, garam masala, coriander leaves, mint leaves and salt. Add cooked mutton pieces (keep the stock water for cooking rice) and cook for another 10 minutes until masala is well coated with mutton pieces. Add oil in another pan; add cinnamon stick, cardamom, bay leaves, curry leaves and cloves. When it crackles; add rice, boiling water, mutton stock water and salt. Cover the lid for 10 minutes in a low flame. Open the lid and give a gentle stir; cook till all the water gets absorbed. In the dum pan add little oil; spread half part of mutton masala. Add half part of rice on top of it; sprinkle mint, coriander leaves and lemon juice. Spread remaining masala on top of it and the remaining rice. Sprinkle mint leaves, coriander leaves, lemon juice and garam masala. Add fried onions, cashew nuts and raisins. Cover the lid tightly (without passing any steam out- put a heavy weight on top of the lid)and put it on the stove top for 15-20 minutes on low flame.